Silvino Larcia Aguila, 80 of North Plainfield, entered into eternal life on July 30th at Morristown Medical Center. Born in Cuenca, Batangas, Philippines, he has lived here for many years. He is survived by his wife, Lourdes, his children; Bernard (Maricel), Loursi, Filipina, Elvin (Laura), Resty (Nestea), Marygrace (Ben), Cheryl (Dante), Abelardo (Ahjoy) & Philip (Nina). He is also survived by many grandchildren. 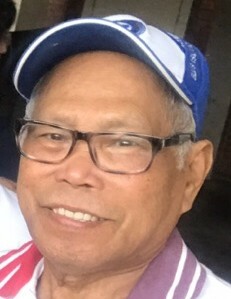 Visitation will be held on Friday, August 3rd from 4:00 p.m. to 8:00 p.m. at the Zuasola-Grillo Filipino Funeral Service, 44 Bay Ave., Bloomfield, NJ. Additional parking located along Broughton Avenue. Interment will take place at Serenity Memorial Park, Barangay 1 Cuenca Batangas, Philippines.